Launched six years ago, the OPEN forum by American Express is one of the oldest examples of social content marketing. All the content is aimed at issues faced by SME businesses, and there is a very established network of other business owners who you can tap into for peer advice. The OPEN forum is now the main source for inbound leads for their small business card. Through steady investment in growth, they have shown an ROI over time. Technology and innovation are well-worn topics on the web. Intel have differentiated themselves by focusing on more personal perspectives with clean design and a sharp sense of story telling. This site uses licensed content from big-name publishers. The content is posted into LinkedIn groups for distribution. When someone clicks on the link in LinkedIn, it takes them through to this site where the article is hosted. Visitors are invited to follow the Content Loop on Linkedin, are given access to further thought leadership content and are invited to connect directly with Cap Gemini consultants. Xerox started small, with a hub focused on healthcare. The quality of their content soon developed a substantial following in the healthcare community, and convinced Xerox to expand the offering into other areas of their business focus. The expanded hub - Real Business - shows how an editorial direction can effectively be driven by a brand's value proposition. SAP Business Innovation’s mission is to help executives develop a deeper understanding of the trends affecting the future of business through fact-based executive research, supplemented by the latest thinking from expert bloggers. It's clearly aimed at answering early-stage search questions for its audience and the design has clear calls to action for site conversion. Sticky Content has created a whitepaper to help create content quicker, easier and with minimal interruptions from the senior team. They're all issues marketers face on a regular basis, so we had to share this with you, building your case for content. Good, shareable content is great for visibility, which might sway senior management in the right direction. Show you can stand among industry peers and even try a 'boast post' containing all your latest content success. Testimonials are a great way to represent your content success. Get a quote, interview or even a video of them saying how much you've helped them. Use evergreen content to minimise maintenance time, and therefore costs. Show senior management that content which won't go out-of-date will impact your bottom line, strengthen link equity and SEO. Which content should be behind a form? Giving away free content is great for gaining web visits and great for users, but putting a form in front of it means you get data too - everyone wins! But how do you know which content is good enough to be locked behind a form? 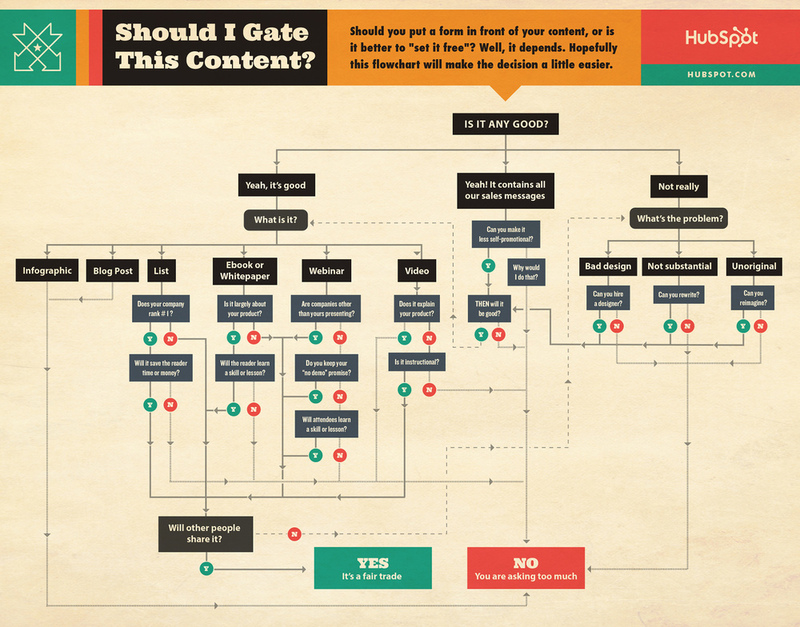 HubSpot have created an excellent flow chart to answer our prayers. This guide provides a summary of our current thinking and best practice for B2B content marketing. Written by Matt Skinner, content marketing analyst at Proctors, it covers the current state of play, strategy foundations, developing buyer personas and benchmark statistics on what content works. Content Shock - Have We Reached Overload? "When supply exceeds demand, prices fall. But in the world of content marketing, the prices cannot fall because the “price” of the content is already zero — we give it away for free. So, to get people to consume our content, we actually have to pay them to do it, and as the supply of content explodes, we will have to pay our customers increasing amounts to the point where it is not feasible any more." In a previous post on the Knowledge Hub, we commented on the findings from the Content Marketing Institute survey which showed that fewer companies reported using content marketing in their mix this year. They reported a drop from 93% last year, to 86% this year. The important change this year was the addition of the phrase "drive profitable customer action"
We view this as a sign that content marketing is maturing, and becoming more accountable. We agree that there has been a glut of content with increasing drops in quality. However, we also believe that the market will self-balance. As content shock sets in, it will become a survival of the fittest. Only the most relevant, quality content will engage audiences and show a commercial return. The rest will be ignored, and eventually have it's funding pulled. So that's our view on the topic of content shock. Here's another blog article on the topic by the ever thought-provoking Heidi Cohen, which collects the opinions of 24 content marketing experts. This interactive guide to financial markets was developed by Goldman Sachs and placed as native advertising in the New York Times. Reviews of the project show that the team were still relying on engagement metrics as a measure of success as opposed to any hard and fast commercial results. It's a very nice piece of content nonetheless. Read the New York Times native advertising case study on Contently here. This article on the Contently blog is an excellent in-depth look at how IBM uses content to promote their brand. IBM are publishing an average of 3 videos a week, and 45 employees run their own blogs. They have 400,000 Facebook followers, 120,000 Twitter followers, and a YouTube channel with over 40,000 subscribers. They are very careful to avoid just talking about themselves. For instance, a recent video campaign called "Made With IBM" focused on how the technology translated to success for a number of customers. It was an opportunity for storytelling which gained over six figure viewing stats on YouTube. The ultimate mark of achievement for IBM's content strategy came when their branded blog for SME businesses, 'Midsize Insider' was promoted on Google News as a reputable source. Read the case-study of how they did it, and the results here. To find out more about the processes, results and examples of IBM's content strategy, read the full article on the Contently blog here. The important addition this year were those words "drive profitable customer action"
It seems like a lot of folks woke up to the fact that there's a big difference between content marketing for commercial results, and just grinding out any old fluff day after day. This is probably just as well, when you look at the frequency that the companies who were surveyed are publishing content. With 42% of B2B companies publishing either daily or multple times a week, that's a lot of budget and marketing resource needing to prove an ROI. The guide covers everything from the business case for content strategy, to how to generate ideas, to how to promote content. Chock full of practical, actionable advice. Highly recommended. This guide to infographics from B2B Magazine covers how to create compelling content, as well as distribution channels and measuring ROI. Includes 3 case studies. The average online attention span in 2013 - down from 12 seconds in 2000. "Thirty-six percent of marketers say producing engaging content is their biggest challenge. *"
To help, here's an easy-to-read guide from Hubspot we found, called "How To Brainstorm Content That Rocks And Converts"
We really like the content map below from Smart Insights, Sometimes it's hard for organisations to migrate from creating marketing campaigns to content campaigns, as creating genuinely readable, engaging content is a challenge. The map shows what content is relevant in different stages of the customer journey. You'll find lots of in-depth guides to how to develop engaging content in our knowledge hub, but at it's simplest, the guiding principles we use in our own campaigns for clients are as follows. That’s not to say that the content can’t be aligned to the services you offer. Supportive, informative and helpful in building a business case. People who are looking for content are in the decision making process. The ideal is content that will be helpful throughout the decision making process. A lengthy whitepaper has its time and place, but to engage an audience immediately when they are online and short of time, just the key points across a short 3-pager should do. ‘Top 10 tips to…’ and ‘best practice for….’ are a great way of engaging a cold audience. Infographics and animations are both popular ways to digest a lot of information, especially factual and statistical based content. They are also very 'share-able' socially. In our own campaigns, we have seen response rates to emails linking to infographics and animations increase up to four times the average over a multi-wave campaign. For more engaging content, interactive content such as ‘ROI calculators….’add value to the end user and are genuinely helpful. Latest content has more appeal. People typically are disappointed to read content that was published less than 2 years ago. Timeless content is hard to create and keep relevant and engaging. What's The Right Content For My Campaign? Want to know which content is right for your campaign? This simple reference guide from Aberdeen Consulting covers everything from video to webinars, infographics to white papers, providing supporting benchmark stats for the effectiveness of each. 68% of marketers rate research reports as effective or highly effective, making them one of the most consistently high performing forms of content marketing. People remember 58% more by watching video vs. reading alone. Nearly 60% said they would watch video previous to reading text on the same webpage. A video in Google’s index is 53 times more likely to appear on the first page search results. 42% of the CMI B2B Content Marketing study participants use Webinars/Webcasts, and place the tactic in the top 5 for effectiveness in driving demand. Webinars are used by 60% of large companies, versus just 28% of small businesses. 69% of businesses now blog. This climbs to 85% when looking at best-in-class companies. Blog usage by marketers increased 27% between 2010 and 2011. 56% of best-in-class marketers invite guest bloggers, compared with an industry average of 39%. Articles are the most popular content marketing format, with 79% of companies including them in their mix. Slideshare is in the top 200 websites globally, with 60 million monthly visitors and 130 million pageviews. Of companies using social media, 20% now distribute content via Slideshare. 69% of best-in-class organisations provide channel partners with marketing content to promote. Only 39% of worst-performing companies do so. Customer acquisition (68%), and Lead Generation (66%) are the top organisational goals associated with content marketing, alongside brand awareness (68%). 31% of companies use microsites within their content campaigns. A useful reference chart from the Content Marketing Institute. It shows the terminology used through the content marketing process, and the typical platforms and content types used. A simple to understand, basic introduction to triggered programs of email content from American marketing automation provider Bronto. The Ideal Length of Everything Online, Backed by Research.